The story of Swedish aviation is a fascinating one, with an indigenous aircraft industry that has turned out some impressive designs over the decades. Equally interesting is their camouflage and markings, and Mushroom Model Publications has been tackling this subject over recent years. The latest title in this coverage is this one, detailing jet fighters in the post-war era. During this time frame, Sweden built several local designs and also imported a handful of different types, all of which are covered in the pages of this book. Following a chronological approach, the book begins with the Saab J 21R, one of only two aircraft that were converted to jet power from piston, with this example trading in its DB605 inline engine for a Goblin jet engine. The book provides an initial chapter that provides an overview history of the J 21R, which includes a service history and an overview of surviving examples (for the J 21R, there were none, so the Flygvapnetmuseum decided to convert an J 21A, much like the original was). After the overview history chapter, the next section details the camouflage and markings of the J 21R, and it is here that we see lots of color profile illustrations that are matched up with photos of the specific aircraft. A detailed description of the camouflage colors is also included, as is information about the specific wing and squadron markings. This same treatment is given for all the aircraft covered in this book. Following the J 21R, the book moves to the de Havilland Vampire Mk.1, FB.50, & DH.115 trainer (J 28 in Swedish service), the Saab J 29 Tunnan, the Saab J 32 Lansen, the de Havilland DH.112 NF.51 Venom (J 33 in Swedish service), the Hawker Hunter F.50 (J 34 in Swedish service), Saab J 35 Draken, Saab J 37 Viggen, and Saab JAS 39 Gripen. An appendix provides additional information on the Swedish national markings and registration markings. For anyone interested in Swedish aviation, this is a must-have book. 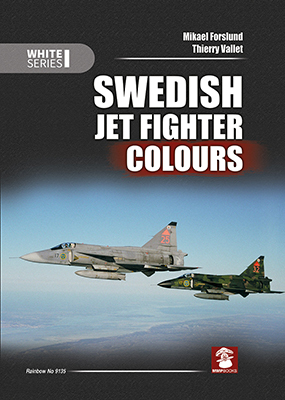 The breadth and depth of information presented on post-war colors and markings is invaluable, and forms an excellent extension of the earlier MMP book on Swedish Fighter Colours 1925-1954. My thanks to MMP Books for the review copy.